Altaf Qadri during one of his assignments abroad. The infighting in Libya between forces loyal to Colonel Muammar Gaddafi and those seeking to oust his government has seen several journalists being kidnapped and killed since 2011. 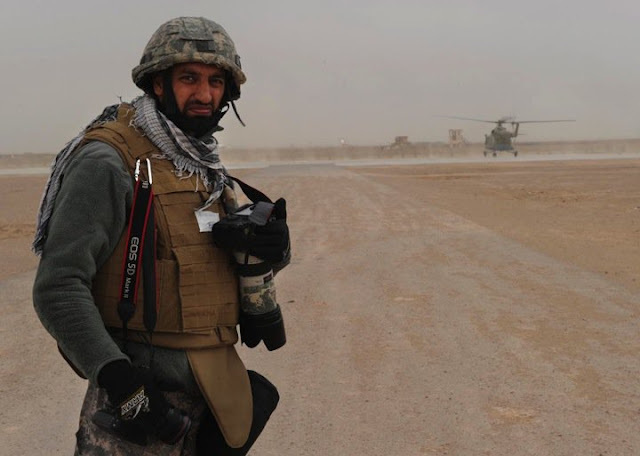 One of the luckiest survivors was award-winning Associated Press photo journalist Altaf Qadri of Jammu & Kashmir who was reported missing on April 9 in 2011 while covering the civil war leaving all his fellow journalists and others in shock. Qadri was always interested in such assignments since the day he took photography as a profession in 2001 despite being a computer engineer. He was thrilled to cross to the Libyan border on March 29, 2011 through the Egyptian land port of Salloum, the main border point between Egypt and Libya. He headed towards Benghazi through Tubruk, one of the best routes for foreign journalists to reach the city as it was under the control of journalist-friendly rebels. The Battle of Brega-Ajdabiya Road was one of the many battles during the Libyan revolution between forces loyal to Gaddafi and the rebels, for control of the towns of Brega and Ajdabiya, respectively. “It was a Saturday morning on April 9 when I, along with other AP staffers, finished our breakfast and were about to leave for the volatile frontline between Brega and Ajdabiya. Our routine was to head to the frontline in the morning, file from Ajdabiya and then head back to Benghazi by evening. It is a pretty long drive from Benghazi and at even 150 kmph it would take an hour-and-a-half to reach the frontline. We drove along the desert which was dotted with the remains of tanks and other military vehicles. I started thinking about the four New York Times journalists who were captured by Gaddafi’s forces the previous month. They were brutalised for four days before being freed. However, things looked normal that morning,” Qadri said. At the time when Qadri boarded the rebels' vehicle. 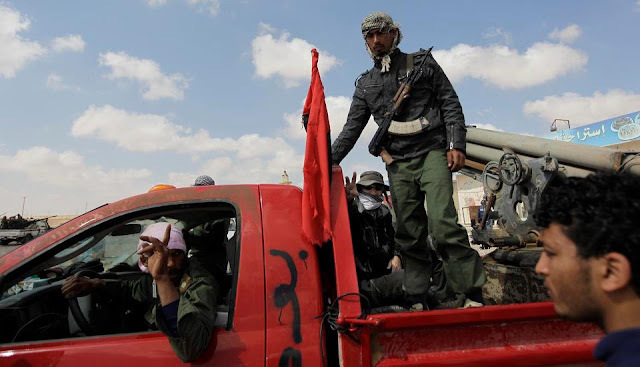 They reached Ajdabiya, the last Libyan town held by the rebels in the east, crossing one of the many checkpoints manned by the rebels on the way to the frontline. Qadri soon noticed some rebels loading grad missile into a red pickup truck with a launcher mounted on the back. 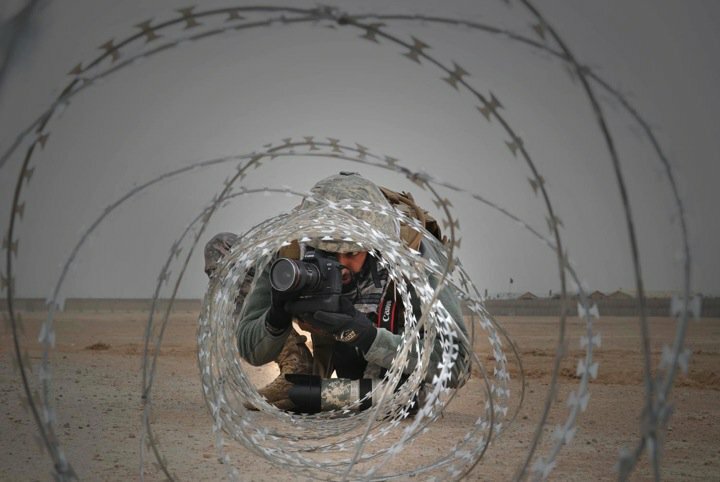 “I thought I would take some photographs while they launch them towards the Gaddafi’s forces’ positions. The rebels looked familiar so I went ahead and asked them, mostly by sign language, if I could accompany them, and they agreed reluctantly,” he said. When he climbed on the back of the truck, nobody actually saw him leaving with the rebel truck. He was lucky to pass that check point in the disguise of a rebel as no journalists were allowed beyond that point. He was thrilled. “I was about to see live action at the frontline. I am sure given a chance any journalist would have done the same,” he quipped. The action had already started at ground zero as the truck advanced for about a kilometre, then went off the road into the desert and behind a sand dune. The rebels fired four grad missiles and then drove back toward the main road to reload. Out of nowhere, their truck came under heavy return fire. Shells fired by brigades loyal to Gaddafi started falling all around them. “There was heavy machine-gun fire, so a rebel and I jumped on the back of the truck. I was sitting right beneath the grad missile launcher. The rebels fired a third missile as they were speeding away and the blast knocked me off. I fell on the sand with a thud,” he said. He tried chasing it but it sped away. “One of the rebels looked at me and tried to tell the driver to stop, but they were too scared to stop, even for two seconds, because Gaddafi forces were closer to us than I had thought and they were closing in. I found myself deserted amid a rain of bullets and bombs,” he said. Bullets continue whizzing through the air and hitting the sand nearby while Qadri ran for his life. “I was wondering why none of these bullets hit me. I rolled down the sand dune and ran back to the gas station, which was still about 500 metre away. By the time I got there, all the rebels and journalists had already fled, including the AP team I was with,” he said. He was now alone amidst the sand and bullets. After reaching the gas station, he started to search for a place to hide. “I ran behind and found three storerooms, a toilet and a small dark room with a shattered glass door. My only option was that dark small room. The door was locked so I crawled into the room from under the shattered-tinted glass. It was a very small room, but dark to my advantage. It had been used as a kitchen before. There was a portable gas stove. I lifted the lid of the stove and placed it just near the shattered part of the door so that no one could see me inside. All this while, gun shots and grenade blasts were drawing closer,” he said. Gaddafi’s forces were now rushing towards the back of the gas station. They were going along the storerooms behind the gas station and kicking the doors, then firing their guns inside. They finished three rooms already, now it was the turn of the small room Qadri was hiding in. “I could hear them walking towards the room. I could hear the shattered pieces of glass door being crushed under their boots as they walked towards my room. I was sure they’d fire at me and then ask for identification. I said my prayers, remembered my family and asked Allah for forgiveness. All of a sudden they stopped just near the door, discussed something in Arabic for a few seconds and retreated to the front of the gas station without firing a single shot into the room. What a relief as they walked away. I took a deep breath and thanked Allah, the Almighty,” he added. This was the place he had to be for the next couple of days till he found a safe way out. It was a 4×6 sq ft with a steel kitchen sink and a small window opening towards the storerooms and a huge wall. The room was stinking of rotten onion and human excrement in one corner, an empty plastic bottle and two steel plates. “I found a piece of cloth which I put over the window to make the room even darker. I took my compact camera and started filming the room, briefly. I disabled all the alarms and reminders from my mobile phone to ensure there was no noise. I replaced my used camera flash cards with blank ones and hid the used ones in my boots,” he said. By that time, his legs were numb as he had been crouching down on the floor for a pretty long time. Many scary thoughts crossed his mind — he was more worried about his family and started looking at the photos of his family and friends stored on his mobile phone which encouraged him not to give up. For five hours, he continued to be in the same state. He even urinated in a plastic bottle. At dusk when all was quiet he crawled out of the room and explored the storerooms. He also saw a group of newly built houses, through a steel mesh window of one of the storerooms, at a distance. “I thought it would be a good idea to stay in one of them, after dark. When it was dark enough, I ran away from the room towards this group of newly built houses which was a few hundred metres away from the gas station. I decided to stay in the middle one to be safer,” he said. In a room he found two mattresses, two pillows and a blanket. It appeared that fighters from one of the sides had squatted in the house. There were empty bottles, empty cigarette packets and food wrappers scattered about. By then he was tired and thirsty. He found potable water in a plastic bottle lying in a corner and an unfinished mango juice packet. “I started contemplating my next course of action. I thought of making my way back to Benghazi, which was more than 150 km from this place, in the cover of darkness, but that seemed foolhardy. I could hear heavy military vehicles and tanks moving towards Ajdabiya. So I decided to stay put unless there was a real opportunity,” he said. The award winning photojournalist later said that it was perhaps the loneliest night of his life. “I was probably the only unarmed man in an area of 150 square kilometre. I fell asleep at about 1 am, but often woke to the sound of NATO aircraft on reconnaissance mission, for a half-hour period about every two hours. A loud bang woke me up at around 5 am,” he said. NATO aircraft had finally started bombing the Gaddafi’s forces’ positions from Brega through Ajdabiya. As the airstrikes ceased just before noon, he decided to take a look outside. He sensed of getting his lost hope back when he noticed a herd of camels outside. “At this point, I thought of disguising as a camel herder but that sounded stupid. I decided against venturing out as the road was very close to the house and there was continuous movement of military vehicles. So I went back to the house. I remained in the house all day, watching from the windows as Gaddafi’s forces drove up and down the road,” he added. At around 2 pm, he saw a group of soldiers, who stopped by at the gas station, eating and resting. And then some soldiers rode a pickup truck and started patrolling near these houses. But there was little he could do. Fortunately, they drove past this house without stopping and headed back to the gas station. At 5 pm, he saw normal pickup trucks arriving from Ajdabiya at the gas station, some of them with the rebel flag. It seemed to him that they were rebel trucks captured by the Gaddafi forces. In the meantime, one of the trucks drove near the house and sent his pulse rate high. He heard men talking outside and then heard someone opening the front door. “I stood in front of the closed door holding my cameras up so the man would see them before reaching for his gun,” he said. As soon as the man opened the door he yelled ‘sahafi, sahafi’ – ‘journalist’ in Arabic. “He was dumbstruck. Before he could say anything I started to communicate with him through sign language so that he could be sure that I was a foreign journalist and hence no threat to him,” he said. He led Qadri to the pick-up parked just outside the gate as other armed men in the pick-up truck pointed their guns on him. He gave Qadri a cheese sandwich and an orange juice bottle while making him sit in the pickup van when he gestured that he was thirsty. He thought the forces were not as barbaric as they were being portrayed. “I couldn’t eat the sandwich due to my dry throat and may be because I was nervous. I was holding my passport so that I could show it before their commander asks for it,” he said. He narrated the story and showed his passport. The commander put it in his pocket and said, “Don’t worry we’ll take you back to your hotel but you have to say in front of the camera that we saved you”. He thought they would shoot him after this. But at the same time he felt they could not kill him if they recorded his interview or maybe they would arrest him and send this video clip to the media saying that they are not as barbaric as people are portraying. “At this point I was still sure that Gaddafi forces have got me. After the interview, he said, ‘Do you have any idea what you have survived?’ As he was talking, I saw a man climbed up on the mosque and flew a rebel flag from its minaret. I was like, Oh My God! They are rebels and I am actually saved,” he said. He saw two rebels walking towards him whom he had seen many a times before on the frontline. They hugged him and apparently recognised him. “I felt completely different now, I was a free man again,” he sighed. The commander he was talking to was a Libyan banker, who had joined the fight like other civilians. “He said they had heard about four missing journalists and assumed I was one of them. He said whole world was looking for you and every newspaper had your photograph and news. This made me so nervous and anxious because I knew if my family knew about this, they would be devastated,” he said. Finally, five of them — rebel commander, his three men and Qadri left in the pickup for Benghazi. They reached hotel Uzu, where the AP crew was waiting for him in the compound. All hugged each other and Ben handed him Thuriya satellite phone to speak to his family. “As I called, my wife answered the phone and started crying when she heard my voice. By then, she had already been informed about my safe return. I felt so bad to make my family go through all the agony and pain,” he said. “I appreciate the way Associated Press handled the whole thing. They made sure that my family was taken care of during those long terrible hours of agony. My long-time friend and colleague Rafiq Maqbool, who is based in Mumbai, flew to Amritsar to be with my family. My eldest sister and her husband were also advised to fly to Amritsar from New Delhi. May be they were expecting something worse. I had to cut short my assignment to be back with my family. If it was not for my family I would have stayed back and covered it as scheduled,” he said.